I present you with Mass Innovation Nights 80, hosted at the Autodesk offices in Waltham. There were a dozen start-ups represented, as well as an “expert corner” presenter. The two student start-ups and four of the remaining ten companies gave 5-minute presentations (with those 4 companies selected by pre-event attendee voting). I didn’t get a chance to meet with all of the companies, but I’ll try to summarize each I met with below, as well as mentioning the two remaining companies based on their descriptions from the event literature. Check out the MIN 80 page (and click on “Vote Here” once on that page) or the companies’ websites (see hotlinks below for each company) for more detailed information, particularly to the extent my descriptions may not do these businesses justice. BikeBus: This business allows commuters to exercise (spinning) while commuting. Daytime revenue streams could be through providing mobile exercise rooms in business parking lots/streetside and renting for themed parties. But don’t take my word for it; the best spokespeople are the company’s founders. 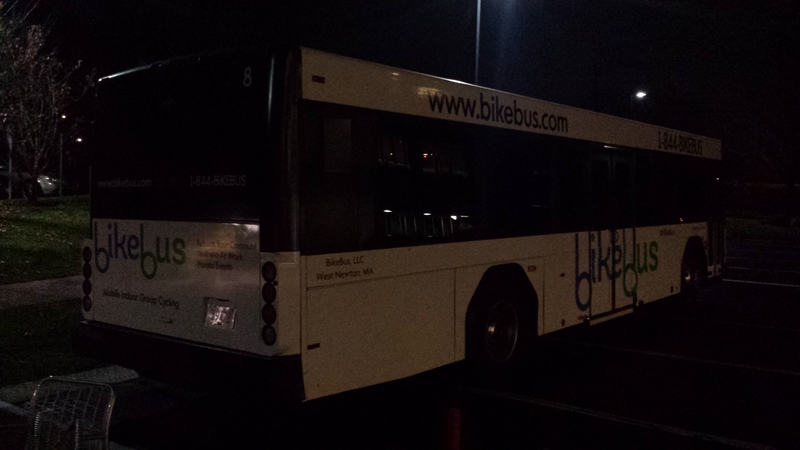 There are also news reports on the BikeBus website’s “press” page. Greenlight Technologies: Winner of tonight’s voting, Greenlight Technologies provides wireless charging for mobile devices, with its software platform allowing location owners to provide a message via coupon or advertisement to chargers in exchange for the charging service. Stack AI: This is a relationship management tool that allows people and businesses to manage their contacts with the ability fully integrate e-mail, calendar, and contacts in the process. QuikForce: This service allows movers to schedule their moves based on preferred time of move, items to be moved, etc. It matches movers with moving services, while standardizing price estimate comparisons. I was given a quick demonstration at QuikForce’s table, and it appears easy to use. The Student Startup Spotlight featured two start-ups from Accelerate, Wentworth Institute of Techonology’s Innovation and Entrepreneurship Center. The first company, Catheter Port, is an effort to improve and ease patient self-care; I think the company name is pretty descriptive. The second student start-up, Organic Connections, showcased a wooden toy meant to help in early childhood development. Expert Corner Presentation: The “expert corner” featured Alan Dillingham, Program Manager of the 1776 Challenge Cup, a competition in which start-ups compete for more than $1 million in prizes. After the presentation, I also spoke with four of the other six start-ups at the event. Fuzzy Compass is a way for bloggers in the travel and food industries to offer their services one-on-one to potential customers. The example explained to me was for the travel industry, where bloggers can act as consultants to travelers planning complex trips. Would you like your favorite travel blogger to help you plan your trip? If so, that blogger could use Fuzzy Compass to help make that a reality. Interesting concept, eh? Nabi Music Center: Obviously, I had to talk to these folks. This is a business that combines my love of music with my interest in technology. Indeed, it’s a site that connects music instructors with potential students for private music lessons. LetsAllDoGood: Connecting non-profit organizations and community groups with their constituents via a smartphone app, this company’s goal is to provide an easier way for organizations to communicate with those who want or need to receive their messages; you could consider it an alternative to the overstuffed, clogged e-mail inbox. Animatron: Easy-to-use animation creation right in your browser. I could go on, but I think I described it will in that first sentence. It does look quite easy to use. I’d refer you to the website for more information. I’m not entirely sure I’ve added anything that you couldn’t have found out just by following this link and then clicking on the “Vote Here” tab of the MIN 80 web page, but hopefully I’ve inspired you to check out one or more of these tech start-ups, whichever interests you. I look forward to attending future MIN and other technology industry events and blogging about them as a useful addition to my usual telecom and tech new topic-driven posts.